You know me (or maybe you don’t) but I do love a film festival. The chance to see films that would have no release or a limited run in cinemas as well as taking in short films from new talent is the main draw. Add to that the talks and networking opportunities plus the possibilities of a party or two and you have a great event to look forward to. We start our journey from last Thursday to Sunday (31 May – 3 June) in the now familiar surroundings of the Picturehouse Central cinema in London’s West End where the stage was set for the 2018 Sundance Film Festival London and a second chance for those lucky enough to go to the main festival in Utah to either catch up on what they missed, see some films again for a second time or just to soak in the atmosphere of festival life for a few days in a warmer climate. Day one style confusion and fuss in setting up a festival is underway as I go to collect my industry pass on Thursday but this is to be expected as the Picturehouse is a working cinema and quite non-stop when it comes to it normal screening schedule. The day for me started with a talk on short film strategies when submitting to Sundance and Mike Plante who programs for the festivals shorts screenings gave a lively if an honest account of not only the process he goes through but also the scale and the type of submissions he and his team receive. In total there is a core team of 6 people that dig through the, on average, 9500 submissions with an extra 4 to 5 people Mike can call on once the submissions have been split into categories. With the quality of shorts ranging from home videos of kids doing talent stunts filmed by their parents for the sole purpose of hoping it will make their kids famous to fully realised cinematic mini-epics, it can take 7 plus months to whittle this number down to 350 ready to shortlist for the shorts strands in the festival. The takeaways from this talk taught me that short impactful stories (try not to make a 20 min film) really grab the attention of the programmers. Not just punchy stories but films which will affect the audience emotionally either through thought or laughter. Better still if you have a 1-4 minute film that may put it in front of a feature which is great exposure for any new talent. The other talks on short films were given by the Film London team where in the case of one of the filmmakers talking the point of his short was to try and promote a feature story, almost like a proof of concept. The theme for the Sundance London this year is ‘What Next?’ relating to gender inequality and this played a big part in the festival not only in the talks but in the fact that 58% of the films presented at this festival were directed by women. No small feat even in this day and age. Inclusivity, as highlighted during the Film Hub London brunch and talks hosted by Film London reminded us that all areas of the media industry still have quite a way to go to bring real opportunities and real change to their gates. All of the causes of inequality must receive equal footing. One thing that needs highlighting is that BAME audiences still rely on word of mouth recommendation when it comes to going to the movies. How that works in a digital marketing world is going to be key to building new and younger audiences for cinemas. In my opinion, I feel the cinema space itself needs to change to reflect the ever-changing attention spans of not only the young but incorporate more of a community feel for more established cinema-goers. This in part came up during the Film Hub brunch as John Cooper the director of the festival explained the need for festivals to be more competitive in the current marketplace. The actual ‘What Next’ talk gave insights into the production and acquisition process of movies from a female perspective with representatives from BBC Film, Film Four and Film London explaining as best possible that the film projects they choose are brave choices and have nothing to do with any quota system real or imagined. The talk became a bit awkward when two ladies in the audience asked about the thinking behind funding Idris Elba’s directorial debut ‘Yardie’ where the audience members accused BBC Film of continuing to highlight stereotypical images of black people. This was soon batted away by Eva Yates of BBC Films reminding us all as filmmakers that it is about the story first and nothing more. 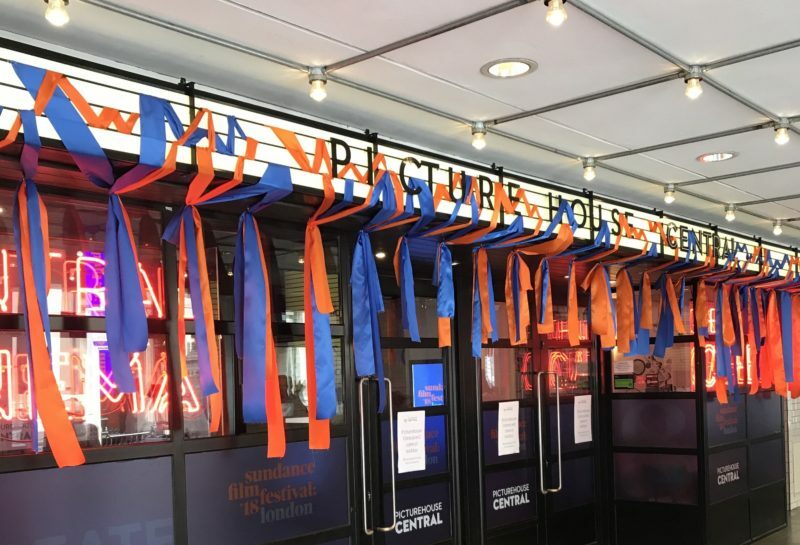 Adobe, Gourmet Burger Kitchen, Mayfair Hotel (who hosted the first party of the festival) and many others took up the mantle of festival sponsors and this made Sundance London for the filmmakers and visitors very comfortable indeed. I only got a chance to see a few films with Yardie, The Tale, American Animals (Surprise Film) and Leave No Trace being the highlights for me. The UK Shorts and Sundance Shorts Tours were very eye-opening and entertaining. At the end of it all and with one lively and sweaty party on Sunday night (I think the AC at the Picturehouse Central may have broken) I can say with confidence that Sundance London is one of the best ways to catch up on a great selection of films if you are unable to make the pilgrimage to Utah.